Monday (8/3/09) Day Off – We were driving back from our trip to Illinois State Park. We stopped at the Willis Tower to check it out. 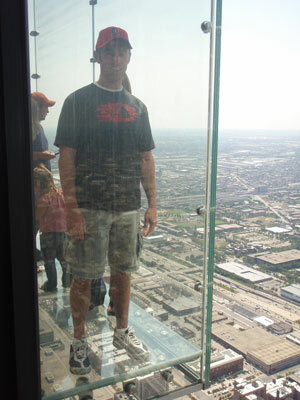 I was a little nervous walking out on to the Sky Deck. Tuesday (8/4/09) Insanity Cardio Power & Resistance – With the time I took off last week I felt like I had lost a couple days and almost like I was starting over. I could barely make it through. Wednesday (8/5/09) Insanity Pure Cardio & Double Header Softball Game. Again it was tough for the workouts as I was still burning through the junk I had in my body. We split the softball games that night. Next week starts playoffs. Thursday (8/6/09) Insanity Cardio Recovery – Felt a little better and was almost able to finish the workout. Even though you do not move a lot in this one the balancing makes it pretty tough. There are a lot of yoga like moves involved in this. My legs were on fire. A couple hours later I went for a 4 mile run as I still had a bunch of energy to burn through. Friday (8/7/09) Insanity Cardio Power & Resistance – I had a very good workout today. Felt like I was back on track. I was able to do more moving push ups then last week, but was not able to finish without taking a break. Saturday (8/8/09) Day Off – Went boating with friends. Was supposed to go golfing but was rained out. So instead we went boating on Lake St. Clair and while the conditions were just as crappy we were able to make it out to Raft Off or what we called it “Rain Off.” We made the best of it. Sunday (8/9/09) Day Off – Was exhausted from the day before. While I was able to get in a bunch of workouts this week it almost felt like I was starting over for the time off last week. The Insanity workout routine is proving to be very challenging. I have not been able to finish any of the workouts without taking a break yet.